1. 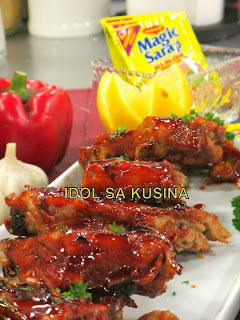 Rub MAGGI MAGIC SARAP and spices onto ribs, place in a steamer and steam until tender. 2. Remove meat from the steamer and rest until cooled to room temperature. 3. Combine oil, garlic, vinegar, soy sauce, ketchup, honey, coffee, pepper and sugar to reduce to desired consistency. 4. Brush the ribs with coffee glaze and grill or broil right before serving.